What is a FPC connector and why do they get damaged? FPC connectors are available in a variety of fine-pitch styles including BackFlip and Easy-On actuators. Most of the times you would see one of these buggers get damaged with pry tools at the time of a screen replacement and with the iphones they are quite easy to damage. Unfortunately they are not as easy to replace as they are to damage. As you can see in the above picture is the top end of the connector, sometimes those pins can get bent out or broken off. A One Mobiles & Repairs can replace them under our microscope with micro soldering and offer iPhone mail in repairs if you are not local to Geelong. Also read: No Power On Your Phone? Crazy enough this is not the only reason that they can get damaged! Yes again we have the culprit that we see a lot of phones get damaged by and that is moisture damage. As we offer services for water damaged phones we do get to see this FPC often get corroded and even burnt away. So don’t forget turn your phone off and don’t try to charge it when your phone has gotten wet and make sure you get it to a technician as soon as you can. We normally will have to chemically clean the board out and then get back to the fpc to pull off the connector and re tin the pads and resolder the new connector on. 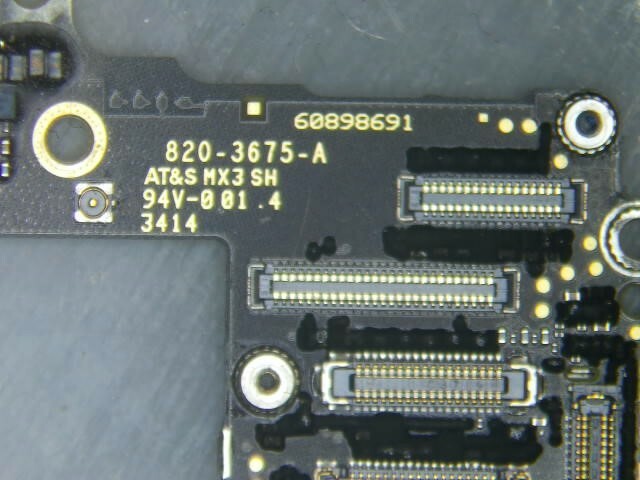 FPC connectors are found on not just iPhone’s they are found on Samsung phones Htc phones and Sony phones. A One mobiles and repairs will replace FPC connectors on any device that you need repairing, local and domestic. The above FPC connections were lucky enough to be saved with just an ultrasonic clean although as i have mentioned that’s not always the case and will have to be replaced. If you are have problems finding someone that can replace these connections we would love to hear from you. We offer mail in repairs Australia wide and offer you wholesale prices for this repair if you are a repair store that does not offer this service in store.